Creating the perfect granola bar (i.e., one that doesn’t fall apart) has been arduous. 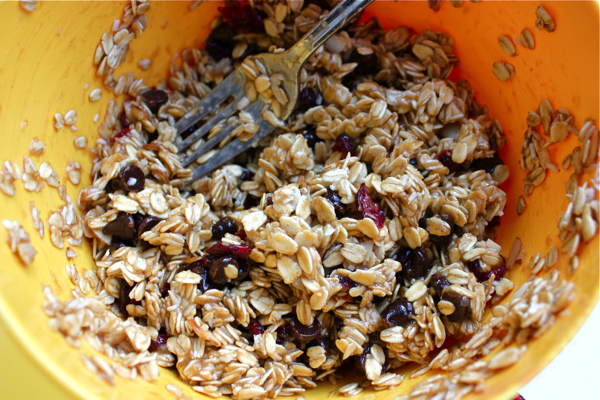 This recipe is adapted from The Pastry Affair, but that method suggests baking the granola in a large, Pyrex dish. I did that at least four times. The first time, the granola bars came out perfectly! They were wonderful! We ate them all. But I accidentally left out some ingredients, and I was in someone else’s kitchen. When I got back home and followed the recipe exactly, the granola bars fell apart. Then, I tried several modifications of the recipe and the baking technique, but all of those bars fell apart too. I have finally created my ideal granola bar, and I can finally share them with you. They are so cute and delicious! To make these cute baby bites, mash up 1 banana in a medium sized bowl. Really mash it up, an overly ripe banana is best. Add to it 1/4 cup of applesauce, 1/2 teaspoon of cinnamon, 1/8 teaspoon of nutmeg, 1/8 teaspoon of ground ginger, a dash of salt, 1/3 cup of brown sugar, 2 tablespoons of maple syrup, and 1/2 teaspoon of vanilla extract. I started out measuring all of these ingredients, but by my fifth batch, I just started estimating. It saves a lot of measuring cups. Mix it all together really well. 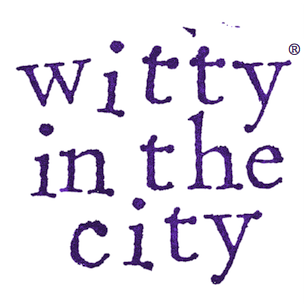 Add in 2 cups of old fashioned oats (rolled, not steel cut), 1/4 cup of dried cranberries or raisins, 1/2 cup of chocolate chips, 1/4 cup of sliced almonds or crushed walnuts, and 1/4 cup of unsweetened coconut. Mix everything together really well. 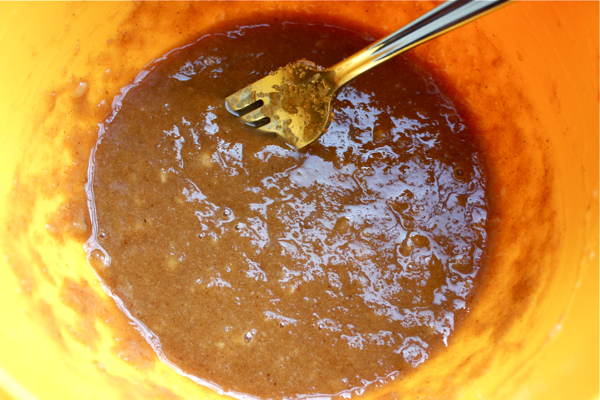 Let the mixture sit while you preheat your oven to 350°F. I don’t know if letting the mixture soak in makes a real difference, but I think it might help the oats be a little bit stickier. Also, thoroughly coat a mini muffin tin with non-stick spray. Add about 1 tablespoon of the mixture into each tin. If you want your granola to be extra toasted and crispy, which is absolutely wonderful, add a little less. Now here is the really important part. Push the granola down into the tin as best you can. I first used a spoon and then my fingers to really compress it. 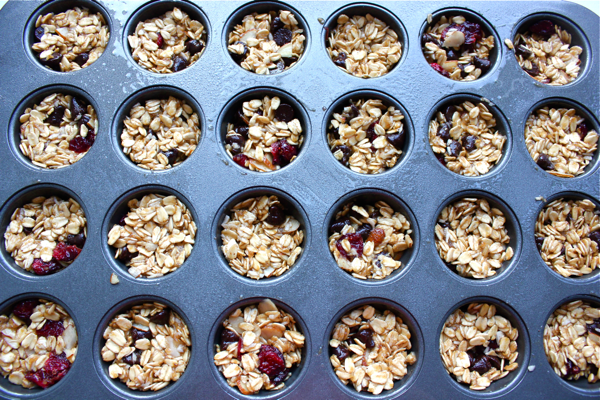 If I had a second mini muffin tin, I would have used that to pummel the granola down more efficiently. 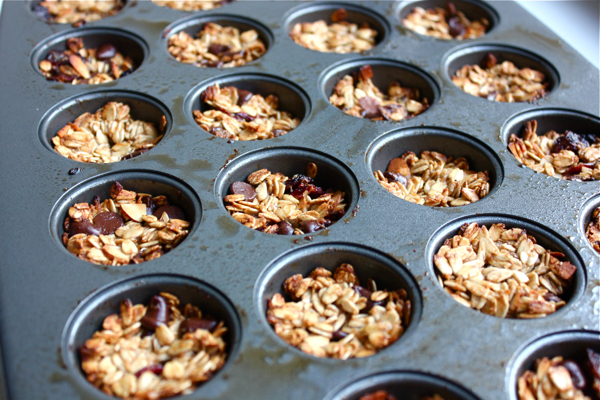 Bake the granola bites for 18 minutes or until they are toasted and dry looking. When they come out of the oven, don’t even think about trying to take them out of the tin. They will fall to smithereens. Let them cool down! Then, use a fork to pop them out, and set them on a cooling rack to fully harden. 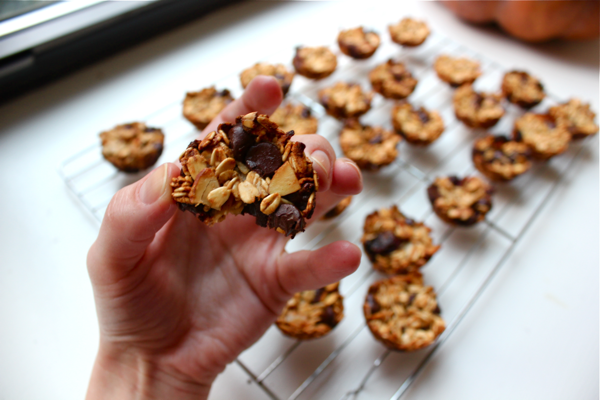 These granola bar bites are seriously addictive. The toasty banana flavor is amazing, especially when paired with the other ingredients. I love them! 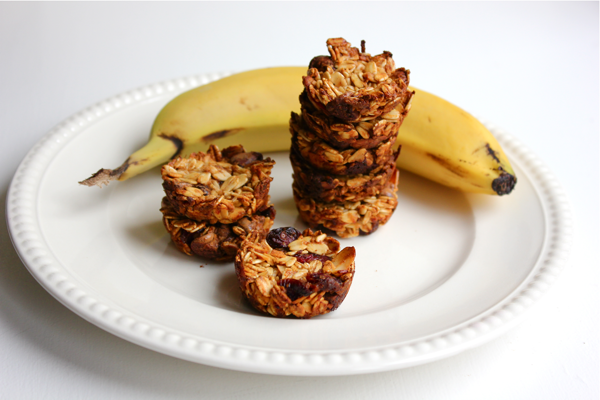 They are the perfect snack or breakfast on the go. I especially like eating them frozen so they are extra crunchy. I love them. If I didn’t love them, I wouldn’t have made them five times to get them right. Now that they’re perfect, I see another billion batches in my future. And I hope in yours too! I know this recipe was written with excitement knowing that everyone will try it and enjoy it as much as you do. I will leave out the chocolate chips,cranberries , coconut and ginger, but raisins will do. I have everything else. Will hope it turns out goodly. I do not think this word is in the dictionary. But it may describe the granola bits. Yummy, I can’t wait to try all of these recipes once I have my own kitchen! I added orange zest and used white choc chips! My 3-year-old helped me put these together. They turned out excellent. Just like you, when I tried to make bars, they ended up as crumbles for the most part. Thank you for the excellent post!